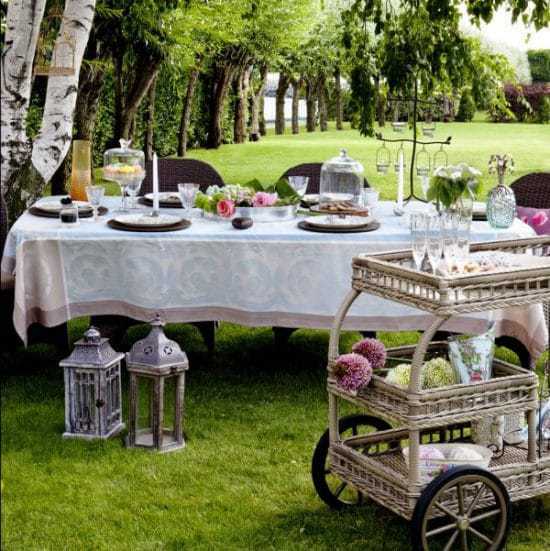 Please check out this ultimate guide to outdoor entertaining – which includes plenty of essential items. So summer is here. Days are long, nights are warm, school is almost out and family and friends, near and far, are about to start descending upon you. So you need to entertain them. This is why I have put together a guide to some of the things you need for outdoor entertaining. 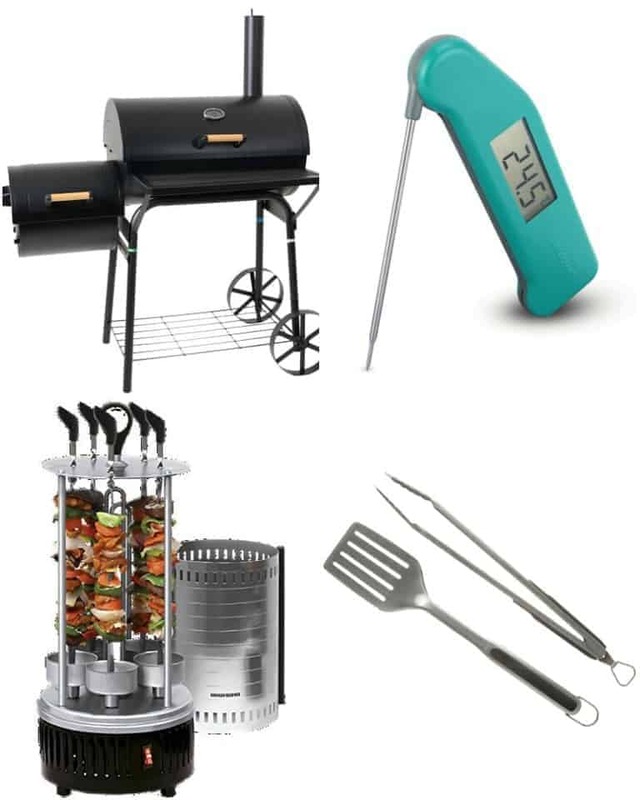 There are bbq essentials, camping essentials for guests staying over, outdoor gear, games, lights and much, much more, This is not a definitive list. It is just a start. This year’s it is all about the BBQ, And we have been putting our new Azuma barrel shaped bbq with smoker through its paces. This charcoal bbq is one of my favourite gadgets. 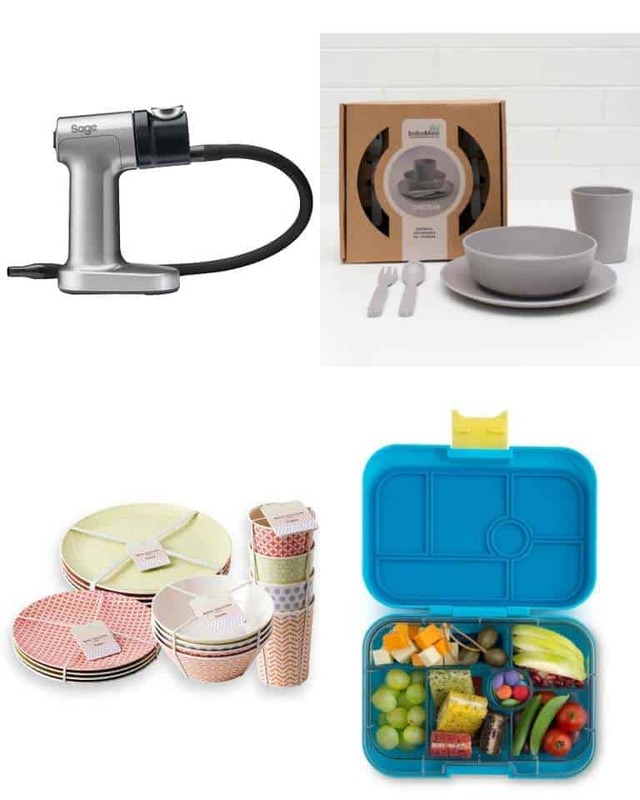 It looks stylish, it comes with a thermometer, raisable cooking tray, a side table to put items you are cooking on, a space for hanging bbq utensils and wheels for easy moving. Plus, I love the side smoker and have been experimenting lots with smoked ribs and chicken. We have a lot of guests coming to visit this summer and every single one of them will have at least one bbq meal. No need to worry if your meat is over or undercooked. Just use the superfast Thermapen 4, to help you get the perfectly cooked meat or fish every single time. It has a fast read-out and gives you the temperature in just 3 seconds. It also comes with a self-rotating display so can be read in any position, has 3000 hrs of use before a battery change, the probe can be folded away (so no more poking yourself in the as you root around trying to find it in the drawer), plus the huge range of colours means there is something for everyone. We all know what the British weather is like, so you definitely want to have this electrical vertical BBQ Redmond as a back-up. 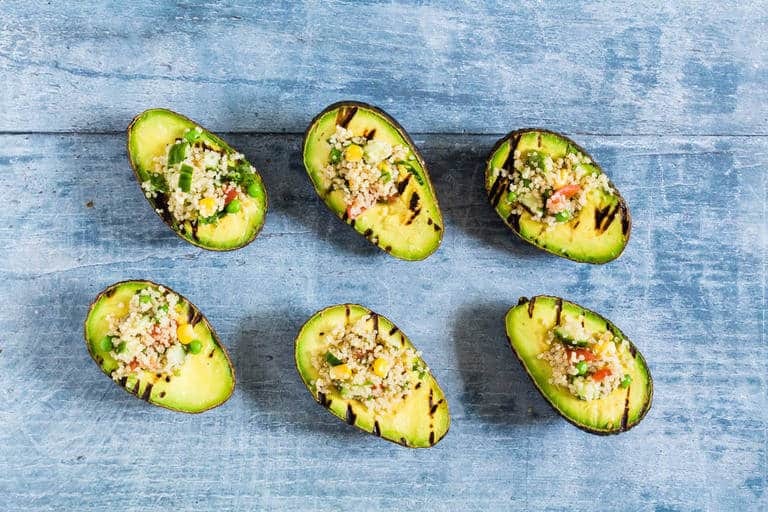 That way you can still offer your guests a BBQ experience even if indoors. It cooks with a charcoal effect and can be loaded with 5 skewers, which rotate around to cook the food evenly. Go on, treat yourself to one. This high-quality OXO Good Grips 2-piece grilling tools set is essential to every barbeque. The set includes a 16″ grilling turner with a wide head and beveled edge for sliding under foods and scraping off the grill. One side of turner head is serrated for cutting meat. Also includes tongs with angled, scalloped heads for lifting even heavy food to remove from the grill. Where there’s smoke, there is flavour with the brand-new Smoking gun from Sage. This fun little appliance allows you to enjoy guaranteed smoke house flavours without actually adding any heat (aka no hard work at all). Simply load with a few wood chips, light and blow the smoke into a container with the food in it. Smoked ribs anyone? Younger guests would love this stylish Bobo & Boo bamboo dinnerware from Eat Well UK. These dishes are completely plastic free and 100 % biodegradable which means they are very environmentally friendly. And they come in arrange of gorgeous colours which children can mix and match to a fabulous effect. For grown ups, isn’t this pastel melamine dinner set from Royal Doulton fun. Informal and bright, the pastels collection really is the ultimate in summer tableware. With four distinctive prints, the range is suitable for all tastes and occasions and can be used to make the most of sunny days. You probably want to run off to the shops and get yourself the entire set consisting of plates, side plates, bowls, tumblers, saving platters and serving bowls. 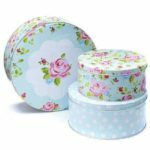 The classic Yumboxes are absolutely perfect for picnics (as well as make the best school lunch boxes ever, according to the kiddoes). These compact and lightweight bento style boxes are kid friendly, leakproof and come with pre-proportioned food trays to help you pack a balanced meal. Best is that the materials are made from food safe materials so are BPA and phthalates-free. Grown-ups are covered too with their Yumbox tapas range. 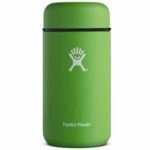 The stunning colours of these Hydro flasks make them almost too pretty to use. But the key word is almost. The flasks are double-wall insulated which mean they keep drinks hot or cold. So great for tea when you are going for a walk, or cool drinks when you think you might be hotter. Last weekend, they did pretty well keeping some mean cocktails cold when we decided to have a cook-out in the woods. They come in various sizes including 21 oz for a larger gatherings. And a bonus is the fact that they come with a nice handle so easy to carry. Create an inviting area to socialise with friends and family in the garden with this Bali 8 seater garden dining set from Wayfair. Crafted from eucalyptus hardwood, it features a dining table, eight chairs with weatherproof fabric and a parasol to keep you in the shade. Alternatively, you can create a more relaxing outdoor area with this Newbury 6 position sun lounger also from Wayfair. It is stylish but is constructed in sturdy rustproof aluminium metallic finish and textilene in a black and silver weave. It has wheels for easy movement and folds away flat for easy, space-saving storage. Get one now. 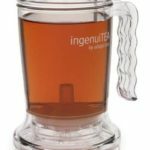 Hot, hot days call for cold, cold drinks which, is where Adagio teas come in, you definitely want to get hold of their iced tea pitcher which is suitable for hot and cold liquids. Bonus is that it is microwave and dishwasher safe. Plus, it has a set of accompanying ice tea glasses. And whist you are on their site why not check out their range of artisan iced tea blends. Yes please to blood orange tea. Smoothies and mocktails would look so good served in this lovely 7 piece glass set from Wayfair. I love the lids which make sure the contents of the glasses are pretty much spill proof and the rustic wooden box with handle makes it easy to transport the drinks round to your guests. You could whip up a Moscow mule or two and serve to your guests in this stylish mule copper mug from Barker & Stonehouse. This traditional piece comes with a dimpled finish on the polished reflective copper surface. Alternatively, you could use it as a decorative centerpiece by simply adding in some flowers or herbs. 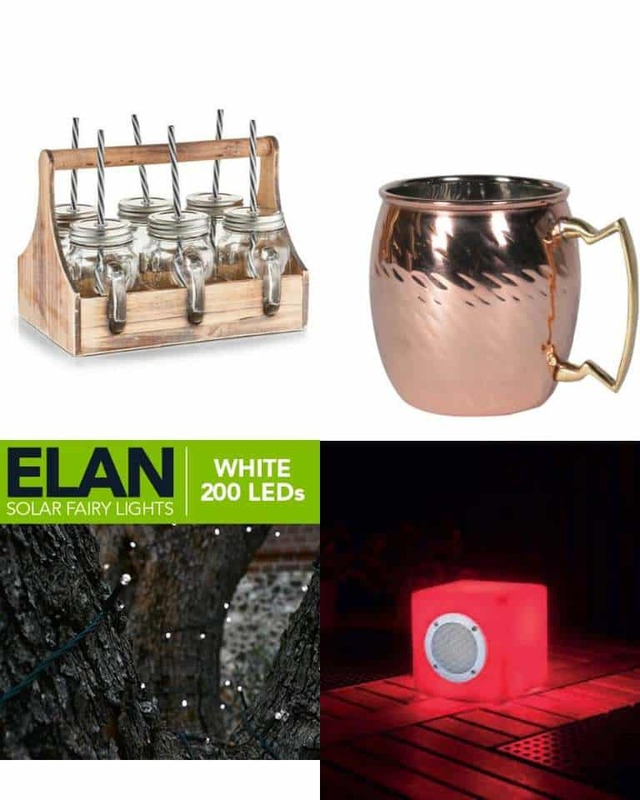 Set up a party atmosphere with these rechargeable Elan solar fairy lights from the Solar Centre. They use the latest LEDs and SMD along with the most up to date solar panels to bring you really good lighting. The 200 Superbright LED bulbs comes with a nicely long 20m string, which means it can be wrapped round a couple of trees. The lights will last for up to 10 hours if fully charged. And the 12 month warranty gives you peace of mind too. Kids (including the grown up ones) love these 20 solar colour changing LED festoon lights from Ligthing Direct. They really do bring out a colourful party atmosphere and will stay lit for up to 6 hours once fully charged. So now you’re all set up for an outdoor evening party, just bring out the Smooz colour-changing LED outdoor table light with speaker. This bluetooth enabled speaker allows you to play music from your smart phone or tablet with a 4m range and comes with re-chargeable batteries. You would use it loads! No outdoors picnic is complete without a picnic blanket and this bright colourful pineapple picnic blanket from Mui Colour fits the bill. The top layer is wipe able, the bottom layer is waterproof and it easily folds up into handy little carry pack, for easy transport. And to keep warm – yes we all know that things get a little chilly in the British summer, right? That is why you want to provide a few of these lovely duck egg blankets from Barker & Stonehouse for guests to beat the chill. Soft yet rustic – they are a perfect way to add colour, texture and warmth to your outdoor meet. Games are so, so very essential in outdoors. entertaining. And if you need a range of affordable games quickly, then head over to rexlondon.com Quoits is a fun game for guest young and old to show off their skills, or you could get a set of their giant chalk to draw up a hopscotch grid. Guest that like a little excitement would love to try their hand out with the secret agent message kit. That is the point of the Great British Summer after all is the rain. So you need something for the rain: and the kids loooooooooooooove living in their Bogs wellies. Perfect for puddle jumping and wave splashing and dancing around the bbq. Their range is sturdy and super colorful and the kids version comes with two handles so that they can be easily pulled up by young hands. I have my eye on the rather stylish Amanda Chukka boots which come in RED, yes RED peeps – so I’ll have to keep them hidden from any friends who might want to “borrow” them. Now there has to be downtime. So bring out these books, which the kids really love: Jaq Jaq chalk books from Eatwell UK. These stunning and portable books are made with reusable chalk paper and come with a pack of dust-free chalk. So not only is there no mess to worry about, but kids (and big kids, no judgement peeps) can keep themselves entertained with hours of drawing, wiping clean and drawing fun. Bonus is that they are the perfect entertainment for long journeys too. 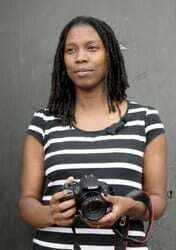 I am African. With that means big, big, big family gatherings. Soooooooooooooo big that they spill over from the house into the garden. So this is where the need for really good camping gear and all the other essentials comes in. The point is to make guest comfortable so that their outdoor living is just an extension of the house. And this gear from Blacks really is the stuff! You need a decent tent, the larger the tent, the happier the African. So this Eurohike Hampton 6-man tent from Blacks is perfect. Stylish, comfy and big enough for everyone but still portable. One of the big issues with people sleeping in tents is lighting. And these 18 LED camping lanterns from Eurohike are great. Compact yet casting out a great light, and perfect for hanging from the centre of the tent as people go to bed – they mean that that “where is the toilet paper in the middle of the night” moments of previous trips are now banished forever. We tend to set up tents a little bit further away from the party so that they have some privacy as well as quiet. Something I learned from a friend is the value of sitting down when you are sleeping in a tent. Sitting on the ground is great for a bit, but there is something so civilized about binging this 4 Eurohike 4-person picnic table. Plus the Eurohike Langdale deluxe folding chair. With these, thay can sit back and relax, and really bring luxury to their day. These can then be used during the day as extra seating for your picnic, bbq or outdoor party. I like providing guests who camp with everything they need including cooking gear. This way when they wake up in the morning and want a cuppa or a treat before the rest of the house wakes up then they can whip up something independently. This TRANGIA 25-8 HA spirit burner with kettle is the perfect solution. It is light and is efficient and because of its larger size it is perfect for 4 people. Again the bonus is that it serves guests but is also awesome for camping later on. 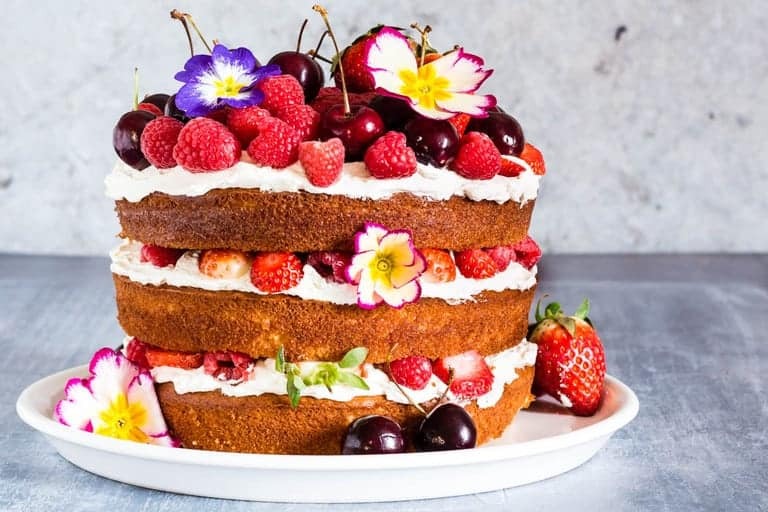 easy kiwi mango pavlova with coconut whipped cream or this berry, orange blossom and elderflower cake with mascarpone whipped cream or fruit pancake pizza. For drinks you could try this ginger beer, kiwi, mango and pineapple smoothie, raspberry mojito, pineapple daiquiri and a peanut butter cookie milkshake. If however you prefer to spend less time cooking and more time entertaining then you could grab yourselves a selection of pies and quiches from Higgidy. I highly recommend their ‘pesto chicken pie with a filo crown. Alternatively head over to Iceland Foods, who have done all the hard work of cooking up the recipes for you. You can get high quality, nutritious freshly frozen food, either rin shop or online. Some recommendations include their 4 spicy lamb quarter pounders, their miso steak burgers, their World Famous smokehouse korean sweet + sticky meaty pork ribs, British chicken selection pack, their nacho bean burgers and their hot and spicy corn on the cobs. Ps grab desserts too with their dairy free Mango & Raspberry Solo Smoothies or their face-plant worthy Primo Italiano caramel swirl ice cream. When sizzle and smoke meets sticky and sweet, summertime al fresco dining is all about cooking on hot coals. 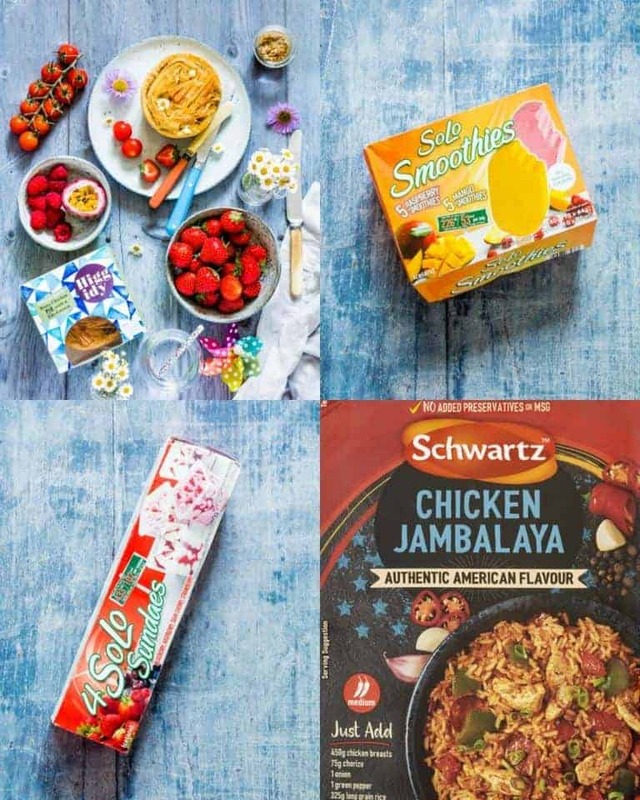 There’s so much more to BBQs than cremated sausages, try a Brazilian BBQ marinade or spicy Cajun chicken wings to liven up the party using Schwartz grill mates or other treats from their new Authentic US range. After all that entertaining comes the clearing up. 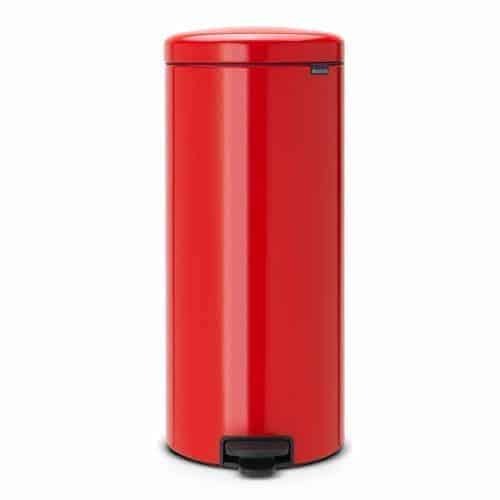 This stunning 30l Brabatia New Icon Pedal bin is the best way possible to encourage guests clean up after themselves. It comes in arrange of stylish and eye catching colours to suit any setup you have. Plus, for every one of these bins bought Brabantia will donate some money to help clean up the plastic from our oceans. Supporting a fantastic cause whilst cleaning up into a stylish bin has just got to be the best thing ever right? I hope you have enjoyed browsing through my ultimate guide to outdoor entertaining. Do you have any of these? 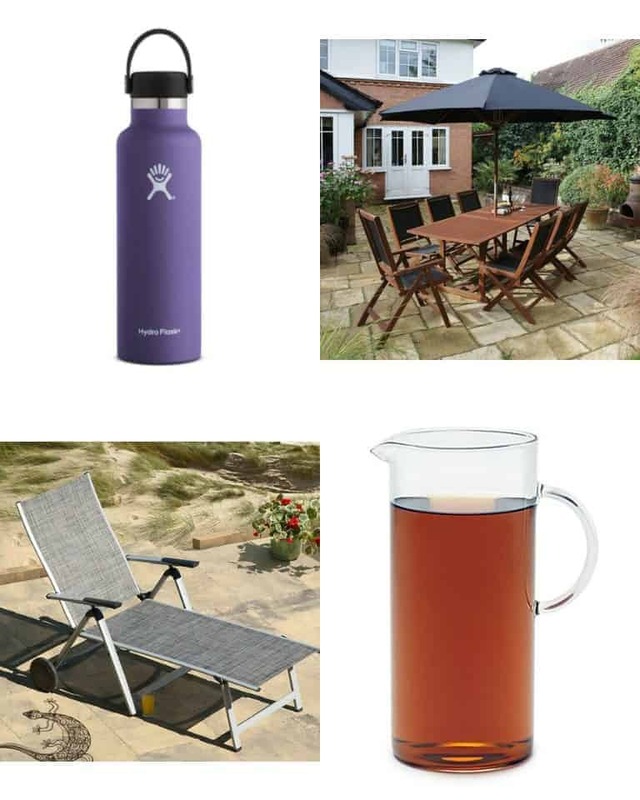 And what other outdoor entertaining essentials do you recommend? The guys from Schwartz are giving one of you the chance to win a BBQ hamper featuring a selection of the grill mates and Authentic USA range worth £40. 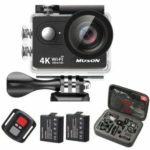 To be in with a chance of winning this, all you have to do is enter via the rafflecopter form below. You can even win extra entries by tweeting and sharing some of my recipes each day. This giveaway is open to UK entrants only and runs until Monday August 14th 2017. Good luck. Thank you for reading the ultimate guide to outdoor entertainment guide post. This post is sponsored by some really lovely folk. Thank you for supporting them, as they make it possible for me to continue dreaming up recipes, African recipes, Sierra Leonean recipes, travel plans and much more for you. Opinions as always, are my own. Header image courtesy of Shutterstock. Other images courtesy of brands or my own. Yeap the smoking gun is defo a must have gadget. So many great products! Thanks so much for sharing them. I love the Barker and Stonehouse blanket, the tent and the 8 seater garden set. Adding to my wishlist! I hope someone like santa or the summer elf bring them for you. Oh man, you do know it’s my birthday real soon right and you’ve given me a TONNE of gift request ideas! 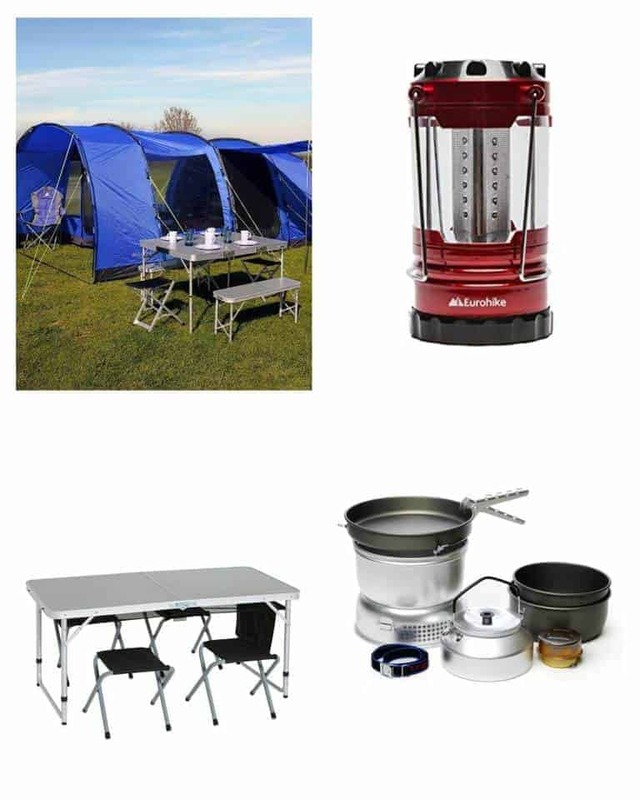 Blacks have a big range of camping items, so please do go check them out. 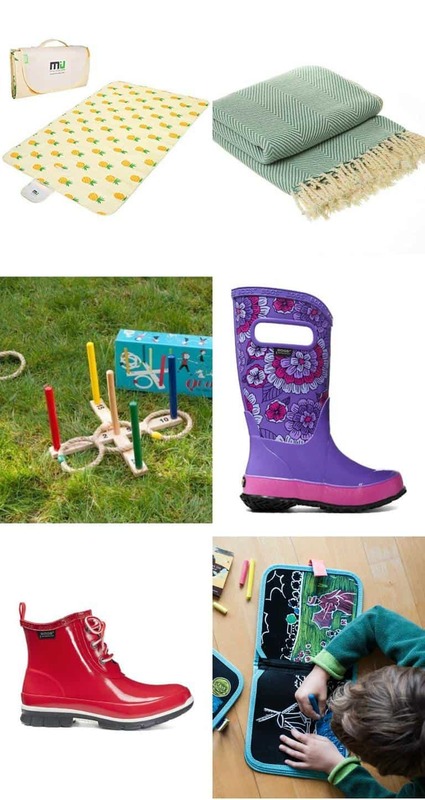 I love the look of the Bogs wellies and I think my daughter would really like them. I know right – all of these would make a great gift for someone who loves entertaining. Yeah, eating outside is one of the best bits of summer. Wow I think you’ve covered everything in this post! I love being able to relax outside while the children explore the garden, they love nature! They are pretty fab right? Some fab picks – that kebab thingy is amazing!